The Stewardship Network is a collection of organizations, government agencies, non-profits, for-profits, and individuals who work to protect, restore, and manage natural areas. The network pools resources, expertise, and energy to help all members succeed in their endeavors. One of their most prominent vehicles to do this is their annual two-day conference in East Lansing, “The Science, Practice, and Art of Restoring Native Ecosystems.” Always in the heart of January and winter, this year’s was January 12-13. BHM has sent a team to the conference since conferences began about a decade ago, as we continue to seek information, new ideas and techniques, and kindred relationships in the field of native land restoration and care. This year, Executive Director Nathan Simons and Blue Crew members Phillip Bieberich, John Brittenham, Josh Hall, Gary Woppelhurst, and Fred Wooley attended the conference. Each day featured a keynote speaker followed by four sets of seven concurrent sessions. Programs are conducted by fellow fieldworkers and students and professors from academia. A strong theme running through the 2018 conference was Native American interests and projects on tribal and public grounds. Conference programs ran the gamut of addressing regional ecosystem needs to practices on homeowner and landscape gardens. As with all conferences of this nature, each set of sessions had two or more of interest for each of us attending. 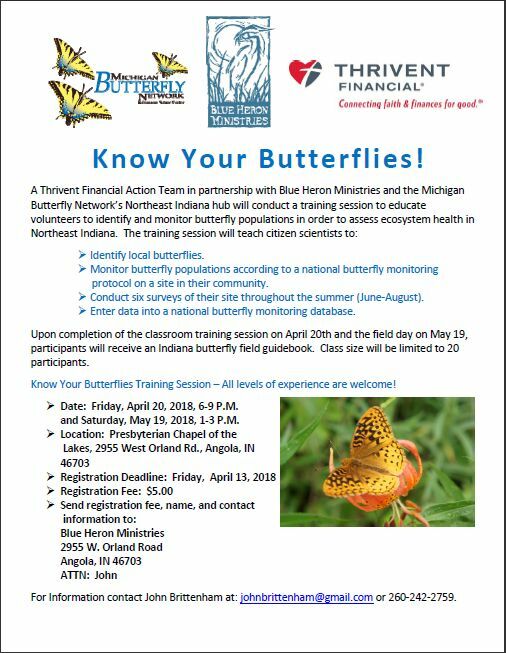 We selected those of personal interest and found that we attended different sessions giving us a broader spectrum of the best practices we can bring back to our work with Blue Heron Ministries. It is good and right to stop work and rest. Resting is something I must discipline myself to do. It is something of which I often remind myself.. that God’s rhythm for us is that we work from a place of rest. Rest first! So. this winter I have taken a few minutes several times to rest in the snow and to understand our Dad’s presence in the moment and in the snow. My three oldest grandkids (Courben, Judah, and Grace) and I took hikes through the prairie and onto the railroad tracks. The snow-covered mowed trail offered the path of least resistance for the little one and for four-footed friends. We followed animal tracks. Rabbit. Deer. Coyote. Did you know that a rabbit at full speed bounds a fill seven feet? Aimee and I dusted off our antique cross country skis and made tracks through and around the prairie. Aimee considered it exercise. I called it rest. A small flock of tree sparrows with their russet caps and dark-dimpled breast have made our prairie home for the winter. There is plenty of aster, goldenrod, and Indian grass seed left to glean. And cover from the wind. The wing prints in the fresh, powdery snow mark the birds’ activity. The dark, dried seedheads and desiccated whorl of leaves of Culver’s root is easy to spot as it contrasts with the snow. And I found a new location to collect wild seed of the plant next year.. a fen at Pigeon River Fish and Wildlife Area. Field mice, as light weight as they are, press into the fresh snow. You can’t go around it. You can’t go over it. So you gotta go through it (or under it). Stopping to observe and appreciate the beauty of snow on the prairie is rest. The prairie plants are resting, too. One third of their biomass is still visible and dead standing above ground and two thirds of their biomass, in the form of roots, is alive (though dormant) below the frozen and wintry ground. The prairie is resting and waiting for renewal from a spring fire and summer’s sunshine. Then it will work to convert the energy of the sun plus water and minerals from the soil into foliage and flowers and see all over again. The first week of January was certainly “welcome to winter” in northeast Indiana. Single digit temperatures and snow were the daily norm. Our work continues in such conditions. We bundle in layers, crack out the big Mickey boots, pull on the thickest gloves and mitts, and have at it. Those small hand warmers come in handy too. We add a little antifreeze tot he herbicide to keep things flowing from our daubers and the brush cutters seem undaunted by the cold. It pays to have good equipment. until finally turning on to a north-south road lined with trees on both sides. It was clear we entered a new type of winter. Everything was white, the road, the trees, all around us, including the sky filled with falling snow. There was no such thing as roadside parking, as snow was piled too high on both sides. Fortunately, we found a pull-off of sorts and gunned the 4×4 truck up into a safe notch in the forest. Getting out was truly stepping into winter wonderland. This is Berrien County, Michigan. Winter skiing, snowmobiling, and snowshoeing enthusiasts know it well. It’s the most southwest county in Michigan and benefits from lake affect snow. We were in it today. We stepped into nearly knee deep snow- that light, fluffy, airy snow. We gathered our gear, including lunches, because it was a 20 minute walk back to the site from the road and we would not be taking the time to walk back just for lunch. First we walked down the road and then turned west into a deeper forest. In a short distance we came to a planted pine grove which was truly magical. The dark trunks were a deep contrast to the all white surroundings. The trail back to the worksite had been broken a day or so before, but nearly covered now. Occasional orange ribbons tied to trees provided the route. Being fourth in line, I felt like the last deer along a game trail. The trail was now the width of two boots and 12-15 inches deep. We finally made it to the site, a wet fen, but not before having to cross a narrow creek. It wasn’t easy on a ten-inch diameter, snow-covered fallen log. Peter slipped and would have taken a cold bath, but a thin layer of snow covered ice allowed him to scramble to safety. Josh and Gary stayed back to cut “hand rails” to place in the creek while Peter and I proceeded to the worksite. It was sort of an open area, but beginning to fill with invasive honeysuckle and autumn olive. The objective was to cut, apply herbicide, and stack the branches, exposing the fen floor to what would be warm sun come the growing season. We set about working and found it to be the most challenging of this winter, not because of the cold, but because of snow depth. It was not easy to get close to the stem and trunk bases to cut and daub herbicide tot he stumps. We plugged away though, working in pairs, one cutting and daubing, the other pulling and piling branches. There were times we’d laugh as in the process of cutting, we’d nudge a limb above and send down a pillow of snow covering our work. Just coming out of the holiday season when we often played Christmas music, I thought of that old Dean Martin song, “It’s a Marshmallow World.” At least I think that’s the name of it. That’s the main lyric and it perfectly describes the world in which we were now working. While out there, we were joined by four people from the Michigan Nature Association who were out flagging future work areas. We laughed as we met up, realizing the beautiful, if not peculiar, conditions for two teams of four to be meeting out in a winter wilderness, so far from a road, so far from shovel and plow. We took each other’s photographs and went back to work. We left at the end of the day and drove as quickly out of the snow as we drove into it. We have not been back to Butternut Creek since. We heard the report for another 10-12 inches of snow the next day. The work conditions would really be difficult at that point. We’ll leave those woods for skiers and snowshoers. There will be other days for fen stewards.. when the snow melts a bit. Every Saturday in October, we travel to different areas of Steuben and LaGrange counties to collect native prairie plant seeds. Come, gather with Blue Heron Ministries friends for the opportunity to fellowship, visit unique natural communities, learn about native plants, and enjoy the autumn harvest. The whole family is welcome! Children often find this to be a fun experience. We’ll meet at the Presbyterian Chapel of the Lakes (2955 W. Orland Rd) at 10AM and carpool to the site(s). We have all the tools and buckets, just bring your lunch. Join Us Later This Week! We’re going to head into the prairie a little earlier this year for the fall harvest. We’ll be after some species that we normally don’t have the opportunity to gather in October. Rain fell off and on all night and into the early Monday morning hours, accompanied by occasional flashes of lightning and rumbles of thunder. Driving into the Blue Heron Ministries office to gather by 8:00am, eight employees encountered skies ranging back and forth from dark to light to very dark, and intermittent rain. Distant thunder was continuous. All was quiet if not cozy in the small BHM office, lined with bookshelves, desks, counters, and dry-erase boards. We sat in a circular fashion, as is our morning tradition, on the variety of chairs, and discussed plans for the wet day ahead, offered thanksgiving, and prayed together. herbicide containers, others would stay back to plan future projects and write for this newsletter. barn and quickly divided into the seed sorting and cleaning tasks. The barn is not big and packed fairly tightly with equipment, supplies, chemicals, plant potting materials, and other items that cover our business over the year. 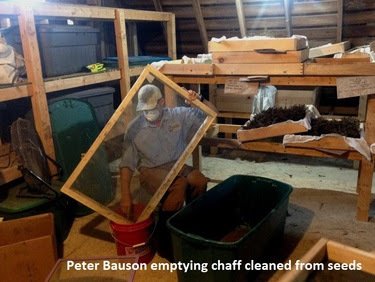 The loft above has no hay, but shelving and racks for drying, separating, and storing seed. throughout the region that offer pure and local genotype species. Enough seed was collected and on racks by July 10, BHM employees today were able to shed rain coats, don dust masks, and screen and bag pure seed. Many proclaimed how great a Ziploc bag looks filled with pure seed. You could say you hold in your hand the efforts of one or more people visiting some of the most beautiful natural areas in northeast Indiana, collecting, laying out to dry, and now screen-cleaning the seed. In that bag is the sunshine of 2017 that fueled the process of soil, water and this unique plant to grow, flower and fruit. 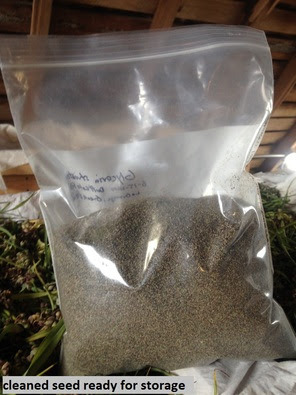 Though just pure seed, in that bag are also that plant’s, roots, stems, flowers, and fruits of many early summer rains for many years to come. Think about that. A rainy day and Monday will never get you down.